Looking for a Chamblee dentist who’s a specialist as well as an all-around excellent dentist? Dr. Shelly Mixson and the staff at Gentle Smiles Dental are the answer to your oral health needs, offering a huge selection of services and procedures that’ll keep your teeth, gums, and mouth in tip-top condition. Dr. Mixson is an experienced cosmetic and restorative dentist, mentored by some of the best in the field at top-notch schools that provided her with a superior education. Furthermore, consistent, ongoing training means she and her staff are always apprised of the latest in dental care, providing you – the patient – with the peace of mind that goes along with choosing a well-trained dental professional. Clear braces – Braces that don’t show when you wear them are ideal for adults seeking orthodontic treatment. They are virtually invisible, comfortable to wear, and generally provide results in less time than traditional metal braces. Teeth whitening – Who doesn’t want a bright smile? With dentist-recommended whitening methods, your teeth can look better than ever! Bonding – A quick and fairly inexpensive way to fix damaged or misshapen teeth or to fill gaps between teeth, bonding is a great choice for many of our patients. Porcelain veneers – A more costly procedure, porcelain veneers provide a superior end result for patients who want their teeth to look straighter, more even, and even more dazzling! Inlays and onlays – These are the perfect way to fix a tooth that has a biting surface that’s been damaged in some way. A consultation with Dr. Mixson can help you determine which of these may be most suitable for your cosmetic dental issues. Are you worried about the long-term health of your teeth? Do you know there’s more you can do to insure your dental health but are afraid of the procedures…and the cost? Crowns – These “caps” can be placed atop damaged or fractured teeth for a more even appearance that will also improve the health of your mouth. Bridges – These will “bridge” gaps in your teeth, help keep existing teeth aligned, and will support lips and cheeks and prevent facial “sinking”. Dental implants – These posts or frames are inserted into the jawbone to support it, to prevent teeth from shifting, or to support permanent dentures. Dentures – At Gentle Smiles Dental, different kinds of dentures – both removable and permanent – are available for patients with a variety of needs. Fillings/replacement of fillings – Let Dr. Mixson and her staff replace your old silver amalgam fillings with tooth-colored fillings that are safer and mimic the natural appearance of your teeth. Tooth extractions – There are a number of reasons to extract teeth and all of them will improve the health and/or appearance of your remaining teeth. Gentle Smiles Dental offers, appropriately, “gentle” extraction processes. If you’re considering restorative procedures to improve your dental health, call Gentle Smiles Dental to schedule a consultation with Dr. Mixson. Do you cringe a little when you look at your teeth in the mirror? Do you feel like others are staring at your less-than-perfect teeth? Do you wish you had taken better care of your teeth when you were younger? Well, it’s not too late. 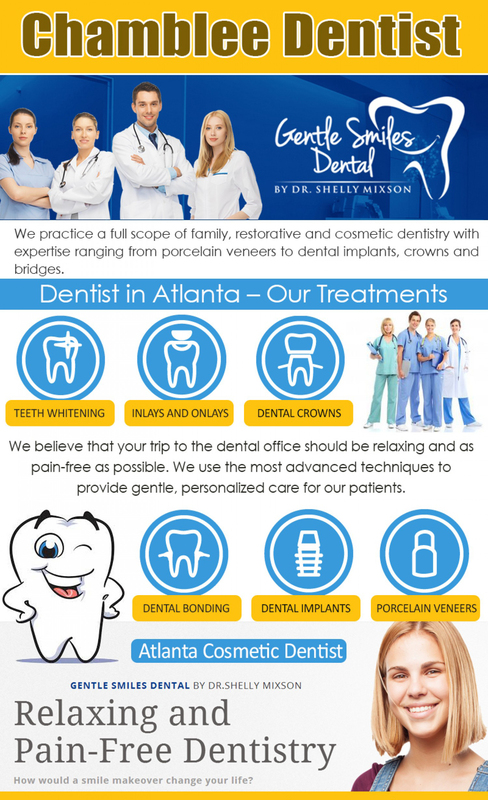 Chamblee cosmetic dentist Dr. Shelly Mixson offers a variety of solutions for teeth that need a little help to look their best. Services range from quick-and-easy to a little more complex, but all provide results that will have you feeling better about your smile. Have you spent money on those over-the-counter teeth whitening products that guarantee your teeth will be 10 shades brighter after using them, only to be vastly disappointed with the results? We’re not surprised! With many over-the-counter products, it’s hard to see the results and, in addition, many people who seek whiter teeth have stains and other problems that won’t be addressed by those supposed quick fixes. Instead, it’s better to receive whitening advice from dentists like Dr. Mixson, who specialize in cosmetic dentistry and can offer a variety of whitening services that will make your smile bright. A lot of our patients wore clunky metal braces during their teen years but have since experienced problems with teeth shifting, altering their once-perfect smile. Some patients never wore braces but wish they had. Neither group wants to go through the “metal mouth” phase again, so what’s the solution? Clear braces! Braces that are virtually invisible are ideal for adults who need to improve the alignment of their teeth. They’re comfortable to wear, often require fewer visits to the dentist, and treatment can sometimes be completed in as little as 9 months, depending on the severity of the misalignment. Dental bonding involves applying a tooth-colored resin to teeth that are cracked, chipped, fractured, or discolored, or need to be altered in shape. Bonding can also be used as an alternative to amalgam fillings. Once your dentist has decided bonding is right for you and has matched the color of your teeth, the process of applying the bonding can usually be accomplished in one visit. Furthermore, it’s an affordable option. Usually made of porcelain or resin, veneers are an excellent solution for a variety of dental problems and can provide a beautiful end result. Usually lasting 10 to 15 years with good care, veneers can solve problems with teeth that are misshapen, misaligned, or discolored. They are difficult to stain and are often the top choice for individuals seeking that perfect white smile. The cost of veneers is higher than many other cosmetic procedures but those who’ve opted for them say their money was well spent. Inlays and onlays are made from porcelain, composite resin, or gold and are used when old fillings need to be removed or replaced. Onlays are more extensive but both are durable and long-lasting. Candidates for inlays and onlays have enough healthy tooth remaining to avoid the need for a crown.